Take a picture of your heat sink contact. 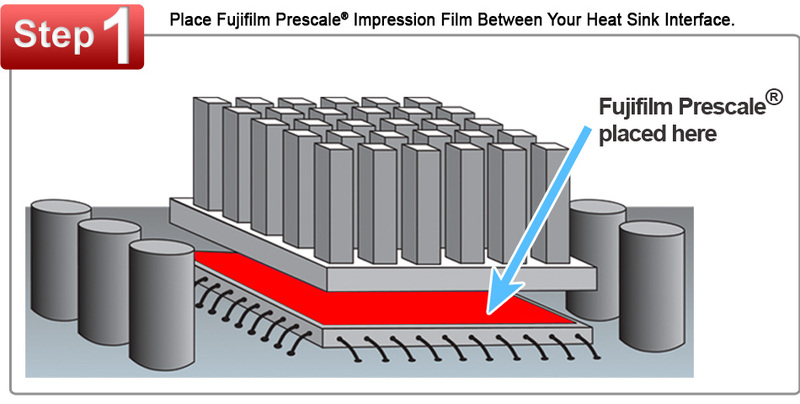 Contact and pressure indicating film for trouble shooting/evaluation of heat sink & contact pressure. Includes 3 tests - one to test contact, the second one to monitor in process contact/pressure changes from lapping or heat sink mounting adjustment. The third to fine tune and validate the changes. The test requires one piece from the red bag(A) and one from the green bag(B), one is donor and the other receives the print. Do not use any thermal compound with this test. Place the A & B with shiny sides to the sink and IHS with the "frosted" sides facing each other. Mount your sink as you normally would - wait 10 seconds, then unmount your sink and remove your test results. Handling tip - As it is pressure sensitive material try to avoid over-handling or moving the sink around too much to avoid over or double exposures and to produce the sharpest print.